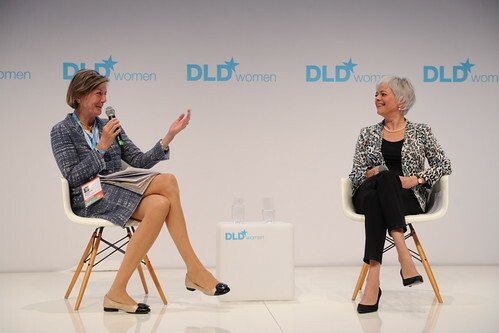 DLDwomen14 Liveblog: Qualify for the Future: Does Digitalization Make the World a Better Place? Cornelia Quennet-Thielen, State Secretary at the German Federal Ministry of Education and Research, talked about changes through digitalization. What are the challenges and how can Germany and the European Union help to guarantee a self-determined life in a digital world. Digitalization is the way we live - what about freedom, security, challenges and opportunities? New centers of power are developing, some digital power centers potentially elude constitutional oversight, new infringements of freedom are coming up, we are online all the time, is this a burden? We all have to deal with the challenges, the risks and the opportunities, e.g. culturally, politically, economically, and socially. But isn't it great to stay in touch with people from all around the world and to increase your knowledge online? And it never has been easier! But transparency will be key to make the digitalized world a better place. The questions about digital freedom and security will determine our lives. And it's not only a political, also an individual task, State Secretary Quennet-Thielen said. We all have rights, but we should also be responsible in this digital world. Supporter and opposer of a digital world have both good arguments. Now it's time to overcome the lack of communications of both sides. Let's talk about opportunities and risks to develop responsible companies. We need to bring together those who push and those who fear digitalization. That's why the EU needs to change otherwise it will be behind the US. We need to set up a new entrepreneural behavior with a culture of failings, and should not simply trust state and companies managing all. We all are able to participate and to make a difference. There's a wide range of possibilities on the internet which makes us powerful and helps us to become relevant in a digital society! Germany has recently published its strategy for a digitalized Germany, a so-called High-Tech Strategy about how to shape the future with all its hopes and fears. Cornelia Quennet-Thielen mentioned 4 main fields of the strategy: security, health, industry 4.0 and future of work, and education. I. security - we have to rethink IT-security. We need to provide a better protection against illegal activities for a self-determined life in a digital world. II. health - we all should benefit from health research to have more personalized diagnoses and treatments, but combined with data security. III. industry 4.0. and future of work - we need more start-ups and innovations to catch up with the US aside communications, but technology alone can not be the solution. Will there be less jobs? No, but different jobs, different work models, more flexibility. IV. education - life long and successful learning in a digitalized world needs media and information competence. Politic will help to strengthening this competence. But society's support is needed. All shoulders together, let's act together now for a free and secure world in the digital age.